Gripsweat - ELVIS PRESLEY - LOVE ME TENDER 78 RPM Rockabilly 1956 CANADA RCA - LABEL ERROR! Here is a super clean playing VERY GOOD PLUS PLUS (VG++) condition original 78 RPM copy of ELVIS PRESLEY performing his classic 1956 Teen Rockabilly Tunes "LOVE ME TENDER" and "ANYWAY YOU WANT ME". 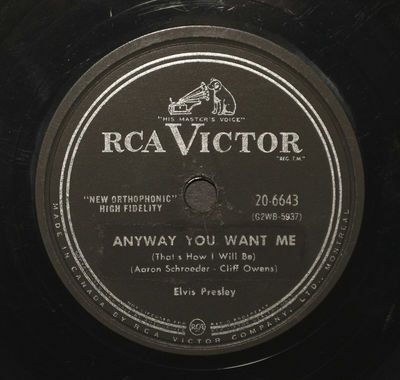 THIS SUPER RARE MISPRINTED COPY IS LABELLED "ANYWAY YOU WANT ME" ON BOTH SIDES, EVEN THOUGH ONE SIDE PLAYS "LOVE ME TENDER", AND THE OTHER PLAYS THE SONG "ANYWAY YOU WANT ME". Record was released on the Canadian variation black RCA label with the inventory code 20-6643. Record has been tested using a high quality SHURE 78 RPM cartridge, and it plays nicely, with no sonic issues other than the expected background pops and crackles. I will be posting many more hard to find 1950s early Rock N' Roll, Rockabilly, R&B and soul 78 records in the coming days and weeks - so keep checking my auctions for more cool stuff. Please note: I take great care to ensure that all records arrive without any shipping related damage. I am happy to combine shipping on multiple auctions. NEAR MINT OR HIGHER (NM OR M) – A basically flawless record. I rarely use these grades. EXCELLENT PLUS PLUS (EX++) - A beautiful looking record that sounds great. Very minimal wear. EXCELLENT PLUS (EX+) - A great sounding record with minimal surface wear and nice sheen EXCELLENT (EX) – A great sounding record with very light surface wear and lots of sheen. VERY GOOD PLUS PLUS (VG++) - A great sounding record with light to moderate surface wear. VERY GOOD PLUS (VG+) - A really nice sounding record with moderate surface wear. VERY GOOD (VG) – A clean playing record with moderate to heavy surface wear. No skips or jumps. Record may have noticeable background noise (pops and crackles) or static when played. VERY GOOD MINUS (VG-) - A record with very heavy wear that has notable audio defects. I will very rarely list a record that grades this low.